Tickets for the Broadway revival of John Guare’s comedic masterpiece THE HOUSE OF BLUE LEAVES starring Ben Stiller, Edie Falco and Jennifer Jason Leigh are now on sale exclusively to American Express card members and to the general public beginning January 15. THE HOUSE OF BLUE LEAVES, directed by David Cromer, will open on Monday, April 25, 2011 at the Walter Kerr Theatre (219 West 48th Street). The strictly limited 16-week engagement will begin previews on Monday, April 4, 2011. In addition to Ben Stiller as Artie Shaughnessy, Edie Falco as Bananas Shaughnessy and Jennifer Jason Leigh as Bunny Flingus, the cast includes Alison Pill as Corrinna Stroller, Christopher Abbott as Ronnie Shaughnessy, Mary Beth Hurt as Head Nun and Halley Feiffer as Little Nun. Additional casting will be announced soon. In THE HOUSE OF BLUE LEAVES, Ben Stiller is Artie Shaughnessy, a zookeeper and wannabe songwriter, who is trying to cope with a schizophrenic wife (Falco), an impatient girlfriend (Leigh) and a visit from the Pope, all while sustaining his dream of hitting it big. THE HOUSE OF BLUE LEAVES is a satirical take on celebrity, religion, and the frequent merging of the two. Nominations for the 68th Annual Golden Globe Awards this morning included theatre stars. The awards will be presented on January 16, 2011. Edie Falco was nominated for her performance as the title character in Showtime’s “Nurse Jackie.” Falco will appear on stage this spring in the Broadway revival of THE HOUSE OF BLUE LEAVES opposite Ben Stiller and Jennifer Jason Leigh. Nicole Kidman, nominated for her role in Rabbit Hole, will return to Broadway in fall 2011 in the revival of SWEET BIRD OF YOUTH. Laura Linney was nominated for her performance in “The Big C.” The series was also nominated for Best Television Series – Comedy or Musical. 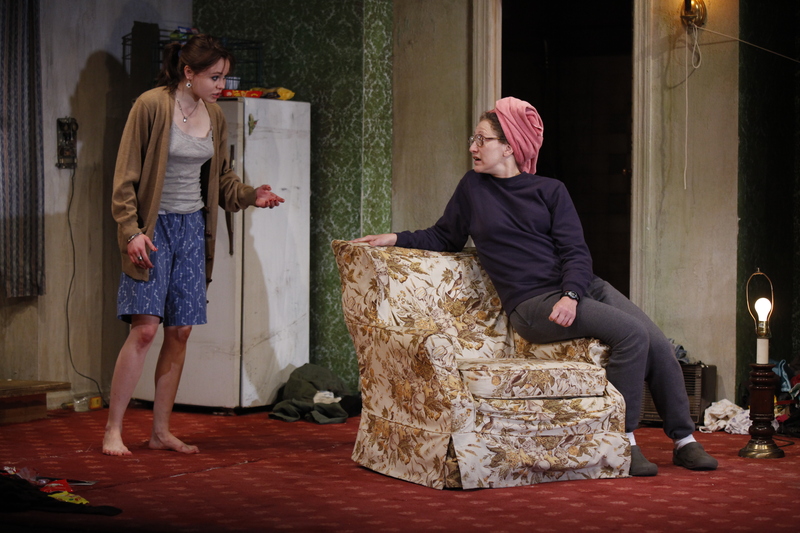 Linney currently stars in the acclaimed Tony Award nominated play, TIME STANDS STILL. Kevin Spacey has been nominated for Best Performance by an Actor in a Motion Picture-Comedy or Musical for his performance in “Casino Jack.” In 2011, Spacey will star in RICHARD III in Sam Mendes’ production for the third and final year of The Bridge Project. The American premiere of This Wide Night starring two-time Golden Globe and three-time Emmy Award-winner Edie Falco and Tony nominee Alison Pill opened on Sunday, May 16, garnering rave reviews for its two stars and for Naked Angels’ continued commitment to producing provocative new work. The hit production quickly broke Naked Angels’ previous box office records and announced a one-week extension to its limited engagement. This Wide Night must close on Sunday, June 27. This Wide Night is written by Blackburn Prize-winning playwright Chloe Moss and directed by Anne Kauffman. Tomorrow’s broadcast of WOR’s “The Joan Hamburg Show” will feature New York’s most celebrated stars. The program can be found on 710 AM from 12–2 PM on Wednesday, June 2. The American premiere of Chloe Moss’ This Wide Night starring two-time Golden Globe and three-time Emmy Award-winner Edie Falco and Tony nominee Alison Pill and directed by Anne Kauffman opened last night at the Peter Jay Sharp Theatre to exceptional reviews. The American premiere of Chloe Moss’ THIS WIDE NIGHT, starring Edie Falco and Alison Pill and directed by Anne Kauffman, opened last night at the Peter Jay Sharp Theatre. Below is Ben Brantley’s rave review in The New York Times. Even without reading Einstein, anyone who lives past the age of 2 figures out that time and space are relative. (When did my bedroom shrink? How did last year disappear so fast?) But rarely do you get to see this law of physics demonstrated with the artistry and emotional impact that Edie Falco and Alison Pill bring to it in “This Wide Night,” Chloë Moss’s deceptively slim two-character play at the Peter Jay Sharp Theater. On the surface, very little happens in this Naked Angels production, which opened on Sunday night. The most eventful chapters in the existences of Lorraine (Ms. Falco) and Marie (Ms. Pill), former cellmates who meet again in London, are probably in the past, an idea that clearly haunts them. Yet as directed by Anne Kauffman and performed by two actresses at the top of their game, “This Wide Night” feels more packed with complex, compressed life than a season of television crime dramas. The American premiere of This Wide Night starring two-time Golden Globe and three-time Emmy Award-winner Edie Falco and Tony nominee Alison Pill begins previews Saturday, May 8, 2010 at 7:30 PM at the Peter Jay Sharp Theatre (416 West 42nd Street). This Wide Night will open on May 16, 2010 and runs through June 20, 2010. A prison sentence isn’t over once you leave jail. Having just begun to rebuild a life on the outside, Marie (Pill) is confronted with her past when former cellmate Lorraine (Falco) shows up unannounced on her doorstep. The two outcasts, once so close on the inside, struggle to navigate a friendship beyond the prison walls – which may threaten their prospects to start over. This Wide Night is a heartfelt and witty portrait of two lost souls trying to find their way in an unforgiving world.